This article is based on ethnographic action research undertaken in a site in urban north India using information and communication technologies (ICTs) towards development of the local community. It discusses the usage of eNRICH2, a web based browser. It includes experiences about how the software can be used in the given field situation and the challenges towards the consistent functionality of such software in an ICT initiative meant to reach the poor and the marginalised. Since the software facilitates recording and archiving of content, the article also briefly touches upon issues of local content development, the cornerstone of ICTs for development. Keywords: India; marginalised groups; ethnography; local communication; poverty alleviation. ICTs do present incomparable opportunities for human development and empowerment in areas ranging from education to healthcare and livelihoods to business; they may also reinforce many of the existing social and economic disparities (Byron and Gagliardi 1998). As Slater and Tacchi (2003) find poverty is a significant factor in limiting access to ICTs and the information that can be gained through these technologies. "The evidence suggests ICT has exacerbated existing inequalities, added Fullan. Among factors that adversely affect ICT's potential to address poverty are widespread adult illiteracy, affordability of the solutions, and the fact that most content is of questionable local relevance," states Ryan (2003, p.1). ICTs may also further strengthen gender inequalities across varied social and income groups. Throughout the world, women face serious challenges that are economic, social as well as cultural that limit or prevent their access to ICTs and thereby to a host of other opportunities (Burka 2001, Gruber 2001). Lack of access and control over ICTs further reinforces other gender inequalities whether economic (for instance, the ability to earn), political (for instance, participation in key political processes) or cultural (for instance, changing existing social hierarchies). Women's marginalisation from ICTs may also mean that they will benefit less from the educational and employment opportunities that will become available through ICTs. Also, as wealth, power and ultimately, the freedom of individuals derive from information where the latter is absent there is little possibility of the former. Achieving gender quality is also key to sustainable development (www.millenniumcampaign.org, 2004). Thus, the disparities in access to ICTs and their possible impact need to be understood and tackled. Specially designed interventions responsive to the needs of these marginalised groups can help overcome some of these barriers (Prahalad and Hammond 2001). Thus, many community based ICT initiatives have emerged across the developing countries. Through consistent effort they have also been able to create access to ICTs for the marginalised groups (Subramanian 2003). Yet, community based ICT initiatives have repeatedly encountered a couple of challenges. Firstly, while ICT skills are valued by the community; collecting and developing information that is locally needed and relevant has often been a major challenge for these initiatives. And while some local information is collected, it may not be compiled and shared in a systematic manner. Another major challenge is internet connectivity. In the absence of reliable connectivity, it is important that centres are able to make available a large body of reliable information offline. In response to such experiences, the eNRICH software was developed in partnership between UNESCO and National Informatics Centre. In a socio-economic context of low incomes, poor education and almost absent civic amenities at Seelampur-Zaffrabad in Delhi, work was initiated in late 2002 to use information and communication technologies (ICTs) towards poverty reduction and better life opportunities. Since opportunities for women were even fewer than for men and there were evident gender disparities, the initiative focused on women in this area. Towards this end, an ICT centre was established by Datamation Foundation, a charitable, non-profit trust, in collaboration with UNESCO and Babul Uloom Madrasa3. The centre initially aimed to impart ICT skills to the women in the locality. An integral part of this initiative is an innovative action research approach based on ethnography4 and complementary to the implementation process. The research findings form the basis of this article. Given the particular socio-cultural context of Seelampur, locally developed relevant content came up as a significant issue from the early days of the initiative. The eNRICH software was introduced to lend support to this process. This article looks at how the software was used at the site and whether it could play an effective role in the local communicative ecology5. The advantages and limitations of such a software and indeed, ICT interventions of this nature are discussed based on research findings. The article concludes with some suggested directions for the future both in terms of the intervention and research in this area. The sociological question that the article seeks to address is that, "Can a tool such as the eNRICH software be useful in creating better access to information for communities and if so, what are the factors that facilitate the use of the tool?" eNRICH is a software for managing content developed for use in local multimedia and ICT centres. eNRICH is simple, multimedia, multilingual and customisable. The software enables local groups to organise information resources from the internet and their own local computer systems. Users then navigate and browse content offline or, where connectivity allows, online. Information is managed through a structure of categories and sub-categories of information. The structure is customisable on the basis of relevance to a given community. Content can be uploaded and made available as text, image or audio from a local computer or through links to the internet. The system's database and interfaces can be hosted online, on a local area network or in a standalone computer environment. eNRICH's communication facilities include bulletin boards, quick access to chat and email services as well as dedicated sections for opinion polls and daily messages. The Seelampur women prior to deployment and development of eNRICH had no organised means to access need-based information in a condensed form and in the local language. Before we discuss the access to information using eNRICH tool by Seelampur women, it is useful to understand various existing means of information and communication in Seelampur, i.e., the communicative ecology6 of the area. The National Capital Region, including Delhi and its suburbs, has been one of the first areas in the country to enjoy television access. TV penetration in Seelampur has been high due to the interest of the people in cable TV-based entertainment as well as low cost cable access available to the people in the area. Like in many other parts of the country, in Seelampur, the cable revolution has been characterised by the multiplicity of entertainment channels showing 24-hour news, films in Hindi, English and other regional languages along with soap operas and especially the popular family story serials. The penetration of radio is quite high; predominantly due to revival of the interest in the FM radio which plays round the clock popular music and entertainment programmes. The Urdu service of the All India Radio, especially dramas, has been immensely popular in the region. Despite orthodox restrictions on watching films and TV soap operas, the people of the area manage to go to the cinema halls in and near this area to watch movies especially old movies /Hindi classics. A lot of people also hire videocassette recorders to watch movies. Newspaper/magazine readership habits of the local people are limited. Reading is restricted more to the men of the area, more so due to lower literacy rates among women than men. Survey findings reveal that only 35-40% of adults read newspapers out of which about 5% are women. The people of the area mainly gain local knowledge through word of mouth, pamphlets, announcements and Masjids7. Religious events like the Quran Khani8 are amongst the limited number of social gatherings that are considered safe for women. Thus, sources of information are restricted for the women, and even the men, in the locality. Access to mass media remains restricted to fulfilling entertainment needs. Further, as the community people shared during the research done in the early days of the initiative, the lack of information on some vital issues clearly places them at a disadvantage in some situations such as those related to illness and employment. The ICT centre aims to impart computer skills and build the capacities of young women. Two courses in computer training are offered – one at the basic level and the other advanced, on desktop publishing and screen-printing. The ICT centre is also an open learning centre for young girls and women, providing them interactive multimedia content for enhancing their vocational and life-skills, and providing rights-based information on various issues. The other significant goals of the initiative are development and dissemination of local content through a participatory process for enhancing vocational skills and also to overcome the language barrier which non-English speaking users of internet often face. As mentioned before, the research also brought up the need felt by the participants to develop local content and participate in this process themselves. Through their enhanced ICT and vocational skills along with opportunities to interact and articulate their views the overall goal was to build confidence in them to take decisions about their own lives in ways which would lead towards gender equality (Sheriff and Gnanalakshmi, 2006). There are over 100 women visiting the ICT centre everyday and the total enrollment for the computer training is around 100 at any given time. More than a thousand young women have been trained in basic ICT skills at the centre since the inception of the centre. Developing local content and facilitating their access to relevant content and information have been the other significant areas in this initiative. The women initially came to the centre in order to learn computing and other ICT skills. But as time progressed there were several dynamic processes taking place in the initiative. One, the centre has come to be valued as a place for social interaction by the women, a place to discuss and reflect on various concerns and issues. Two, there is a lot of keenness among the women to gain information on a wide range of areas – education, livelihood, health, women's rights etc. Third, there is also a strongly expressed need to learn various vocational skills and be economically independent. Four, in their participation in the centre and its activities their interest to share and to draw from their rich cultural tradition is evident. These processes are elaborated upon below. Research findings indicate to the effectiveness of the ICT centre in expanding a user's social network. It has provided different channels for the flow of information between people who have not previously been in social contact. Seelampur women are severely restricted in their mobility and therefore in their ability to participate in any social networks beyond their immediate family. The internet fascinated these women beyond imagination. A group of women who have discontinued their studies were interested in using search engines from an experimental point of view. This group was initially less interested in actual information retrieval but they felt overwhelmed when they were able to find the relevant site for which they used search engines. Generally the community was not aware of the availability of information through the internet. As the project progressed the participants became more aware about the power of information and how to obtain it. Invariably there is a demand for the information on various courses being offered by open schools, open universities and also to find out examination results and scores. With a fair amount of emphasis among the younger women on looking attractive and slim they also like to get information on the latest in fashion10 and beauty care. Women are mostly accessing internet through eNRICH, but occasionally they open it through Internet Explorer. The women also expressed desire to get training in vocational skills. Given their poverty and lack of education, the possibility to have an income of their own is very attractive to many of them. A lot of the content generated at the centre focussed on some vocational skill and these are quite popular among the women. ICTs have given to the women of Seelampur new means to express and articulate themselves and also be heard by others. Women started first with designs—sharp, colourful designs have been created from their socio-cultural context—applying Paint Brush. These designs are quite useful for them in their own tailoring and dressmaking work. Once they got exposed to the multi-media capability of the computers especially the recording features of eNRICH, they started recording enthusiastically. These include Naat, Ghazals and Sher-Shairi11. Women were quite enthusiastic in doing these recordings. "I got inspired by the participation of the others, such as, the project coordinator and staff, self help group leader or the tailoring instructor. I also want to record and share my views about things" says a 17-year-old participant of the centre. Such interest led to a lot of group activities as they started discussing amongst themselves how they could improve the content. As a result, a large volume of content has been generated which hones their ICT skills as well as links them back with their oral traditions. The local women have till now contributed over 150 pieces of local content. The research methodology used in this initiative is called ethnographic action research combining both ethnographic and action research approaches (Tacchi et al, 2003). Ethnography is the in-depth study of a culture in all its rich detail. Action researchmeans integrating research into the development of the intervention. This kind of research is flexible and responsive to the needs of the intervention and the particular socio-cultural context. The research is an integral part of the initiative and is not restricted to specific points of the project cycle. At the Seelampur site, ethnographic action research was initiated right from the onset of the initiative. Initially, a small sample survey was done to understand the socio-economic context of the area and its communicative ecology. During this phase, some key informant interviews and group discussions and mapping were also done. After establishing the centre and initiating its activities, research tools that have been used are user feedback, in-depth interviews and focus group discussions. Observation-based field notes have been an integral part of the entire project cycle. Field notes are written by more than one site based researcher, sometimes in the local language and later translated for analysis. The issue of local language and content is quite significant because of which even if computers may be physically available they may continue to be "out of reach" in crucial ways. Content that is relevant and in local languages is a priority next to none in these ICT initiatives. Such content can be organised, archived and accessed in a systematic manner through eNRICH. Further, eNRICH provides the users with opportunity to access information collected from a range of sources and in a location where power and internet connectivity are both unreliable, it helps to access all this information even while being offline. The users/direct beneficiaries are the ones who come to the ICT centre to learn, basic computers skills like familiarisation with Windows and programmes like MS Word, Paint, Wordpad, Media player and Excel. They seek information from the centre on a wide range of topics. They view vocational CDs that include vocational skills and life skills like health awareness and women's rights. They are also encouraged to produce their own multimedia programmes. Slips consisting of information that the users are looking for, questions etc. Group of volunteers are the ones who are the trainees and ex-trainees of the ICT centre. After benefiting from the information provided at the centre they have now extended support towards the updating of local information on eNRICH. They moderate and filter the information been put by the users into the information box. Saira 25 is a volunteer of ICT centre. Who first came to learn computer later volunteered her for the centre. During my in-depth interview revealed. She used to feel very upset mentally until she started coming. She came here under frustration, as there was a big fight between her father and brother taking her marriage proposal. She was being pressurized from both the sides to accept the proposal they have brought for her as both of them had given their words to someone they knew. She was under high pressure and in dilemma. If she goes in favor of father, the brother only her bread earner member of the family go against her or if she takes decision in favors of brother, father is committed not to see her face. Caught up in dilemma and unable to make any decision came to ICT centre to see the module on 'Nikah' [Islamic wedding], recommended by her friend. Saira says after going through the module number of times, I feel better as I have now learnt that a girl has right to say no to the proposal. I am feeling relieved that I have not committed any sin by refusing proposal recommended by my brother and father. I encourage every girl coming here to go through module and get equipped with knowledge. I have initiated discussion on this so many time that now I have learnt each and every line of this module by heart. Just like Saira. There are many Sairas who come to upgrade their knowledge for a say in the family. In a male dominated, not so open patriarchal society, where woman are not even taught about their rights and have no space to share or access right based information and are forced to give decision in favor of father or brother. In one of the conversation another user Rabia, said that she has enriched herself with the rights of 'Nikah', but is it also necessary that she should also know about 'Talaq' [divorce]? Aisha 30 years old and mother of two children is regular attendee at the ICT centre. She first came to ICT centre to learn computer in 2003 through her friend. Her husband is a clerk in Jakir Hussain College. She comes along with her two children, hence is called Aisha Bhabhi by young users. Her name Aisha Bhabhi is on the lip of most of the participants. Her reaction about the ICT centre was that she had not thought initially that she would get to know so much from eNRICH that she would be so regular and volunteer her time. A Desk manager uses various tools to collect information to meet the information needs of the community. Desk manager collects information from local papers/magazines, internet, government departments and other institutions in the area and from the Information Box. Every weekend he/she sits with the volunteers and discusses information asked by community women and also provided by them. He/she condenses and translates it into the local language and finally uploads it into eNRICH. Guddi graduated from Open University is a computer instructor. She also plays the role of Desk Manager. She uses media mixes to meet the information need of the community. She has adopted a variety of tools for collecting local information. Thus ensures to meet the information need of the community. Apart from collecting local information from local newspaper, she uses regular participant of the ICT centre as an information agents. These participants put the slip in a cardboard box placed in ICT centre for the information they have been looking for as well for providing any piece of local information they have. Often she has to access information using internet. This way information gathered from various means needs to condensed and translated in to local language. Every weekend she sits with the team of volunteers and discusses information sought from the community women and also the information provided by the community women. She along with her team of volunteer, ex-trainees of ICT centre, analyses the information material gathered. After completing the moderator part she, with the help of community women, compiles appropriate content in local context. When appropriate content is ready she takes the job to upload it on eNRICH. Her role does not end here since she has taken the responsibility of uploading local content she has to facilitate a lot of interaction and participation. She constantly keeps updating the information on eNRICH. Based on her ethnographic observation she created a sub-category of designs and patterns of different types of neck of ladies suits. Which was extensively used by the young women and this particular category apart from poll questions and health category became the most popular among users. One day I (the desk manager) was facilitating them to find a site using google search through eNRICH, having information on Dengue fever-an epidemic plaguing India during the monsoon season (the request had come from one of the women who had suffered from Dengue fever last year), when I was translating, many of the women present at that time took out their notebook and started taking notes. And that particular girl who had suffered was seen more curious to go into details about the causes, prevention and treatment. She was very interested to know the name of the mosquito responsible for Dengue fever. Opening of the site on Dengue seemed to have initiated the first ever debate on diseases caused by mosquitoes such as malaria, typhoid and other epidemics. SARS was also discussed at great length and then question of the origin of SARS disease led to opening the sites having information on SARS. Note – Black arrows and boxes denote the main process. Boxes with blue borders indicates tools/roles for facilitating eNRICH use. Initially the process of gathering information was informal and incremental. Gradually, a management group that has evolved to run the day-to-day affairs of the centre from among the participants have been entrusted with the task of collecting and uploading information onto eNRICH. It makes the process participatory, friendly and innovative. The system supported by the use of eNRICH has established its credibility and standing in the community, and has led towards more informed women in the community and contributed towards their empowerment. The confidence level of the participating girls and women has increased. eNRICH has been used to provide correct information to the young women to realise and understand what is good for them and take the right decisions regarding their lives. It gives local information on health services; Delhi government's welfare schemes and grants, public utilities and services are compiled, listed and circulated among those seeking information. I was keen to know whether all these modules and materials we collected and put on eNRICH has any significance in the life of young women. So while I was talking to Aisha Bhabhi, others also clustered around me and began to hear. Aisha Bhabhi stressed on the need to discuss on these topics, which are pertaining to women's health in practical life. She speaks very softly and sweetly. She said she keeps motivating others to know more about ourselves specially our body. She continued saying that in our family we give lots of focus on learning vocational skills but just do not pay any attention towards health care measures. We strive to learn new skills but always ignore to know about our body, health as we are not so open but this is the most essential. I do not exactly remember how suddenly the topic on AIDS came in between. Most of these young women then said that in school they had got a kit on AIDS but neither had they discussed in school nor at home. Guddi began to ask the full form and how it is transmitted and can be prevented. Though most of the young women present there had fairly good awareness about its spread. But none of them mentioned that it is transmitted sexually also. It is not they did not know but they were very shy. Jahaara (earlier used to be shy but now takes active part in discussion) referred to TV programme and updated the group about various modes of HIV infection spreading. Aisha Bhabhi then told the participant that only being aware about the disease is not sufficient they should use the knowledge in every day practice also. Like whenever you go to the doctors ensure that either a fresh needle or properly boiled needle is being used. Saba said that alertness is very important. It is mainly to the issue of health that most of the common participants would like to contribute either by using the message of the day, poll, or service category. It has been observed that the general absence of information related to health and fast growing awareness towards health motivates young participants to contribute their knowledge using eNRICH. After realising this need, community people arranged for one doctor from DOTS12 to sit at the Madrasa, who now handles as many as seventy cases from the community in a week. Often young women access health information for their relatives or friends. There have also been a significant number of participants who accessed information on services available at hospitals in their area. For instance, one participant called Shabnam wanted to know about the availability of the paediatrician for her nephew. She wanted to take appointment from the doctor before visiting him. Large number of participants have been using eNRICH for getting information on railways and roadways enquiries. It also gives information about passport and ration card, how it is made and what documents are required for them. Some participants also use eNRICH for accessing their computer proficiency scores since the Centre has been updating the scores on eNRICH. eNRICH is also used to share and discuss about their culture, practices and festivals. On occasions, for instance, during Eid celebration sumptuous recipes for making kebabs, biryani and desserts have been exchanged. Thus, the eNRICH software has proved valuable in compiling and archiving information for easy access by users. Much of the content is also locally generated or compiled and in local language definitely increasing the possibility of the users gaining from the information. By facilitating the active role of participants in development of local content, eNRICH also presents rich possibilities in the area of local content development that has been a challenge as stated before. But as the narratives point out, their participation was made possible because of the environment that the women had at the centre that allowed for their free expression of both their talent and their views. Despite achievements, it would not be out of place to mention that the intervention of this nature cannot succeed without intensive and sustained work by a team of people and adequate technical resources. Seelampur ICT project certainly requires technical support and infrastructure in terms of trained local people, assured power supply, internet connectivity and a suitable environment. It is pertinent that this women-led initiative moves on. And for this, the continuous up-gradation of information is very important for which people of the community have to be motivated from time to time so as to be able to deliver local information. There are technical problems in accessing eNRICH. There are limitations in changing and availability of login IDs, which has been impeding the usage of eNRICH. If this login ID issue is sorted out, as well as flexibility towards creation of new IDs is given; it shall make the eNRICH browser more robust and sturdy. There are also issues regarding the human resources involved in using eNRICH. Even with regular contributions to information from various sources and an active desk manager, in some cases area-experts are required to vet the contents being uploaded on eNRICH. This makes the use less cost-effective and self-sustainable. Though Sanjeev the Desk Manager is there to assist him, but lack of coordination and understanding between the Desk Manager and in charge pushed us to think upon the role of Desk Manager (sounds very high profile). Moreover often we noticed his rude behavior with the community, (if someone would ask him to teach how to operate internet, his response would be so hurting that no one would dare ask him next time. Quite common reply he has if he will tell everything than what's the difference between him [a manager] and others, and will use facility for his private work thus the bill of internet also gone very high, though he is quite capable in his work and maintaining eNRICH but requires consistent observation and pushing). Even along with limitations eNRICH has been useful to provide a range of information from information about Eid and other festivals; to information on apparel designs and dresses; to that on educational and job opportunities. Apart from information of general interest and entertainment, information on health and education are highly sought after as discussed above. Information is enthusiastically accessed by people of the centre and thus leads to increasing their knowledge and levels of confidence at the same time. Due to the sustained and high levels of enthusiasm to develop and gather content locally among the young women at Seelampur, plans are being made to use eNRICH in other aspects of the intervention such as group formation, in their campaigns to raise awareness about anaemia and reduce the incidence of anaemia, and so on. Not only in the manner in which eNRICH can store information on a wide range of topics but also in the way it has potential to bring together information from various levels, global (through the internet), national/administrative unit (through government sources and local key persons) and the local level in innovative ways makes it unique. The selection of information is based on multiple factors – need, credibility, relevance and so on. So, what the individual user gets at the end is a useful package that combines more than one source. This is potential has been tapped well in initiatives such as Seelampur's and can be further developed. Towards this end, in August 2004, UNESCO and NIC were joined by One World International in a new collaborative partnership to redesign the software and integrate new functionalities. This version will be based on UNESCO and NIC's experience with eNRICH and OneWorld's with Open Knowledge Network, a content sharing network initiated in Africa in 2003. The new development process will result in OpenEnrich 4.0, which will be built using open source tools and released as an open source product. It is quite clear from the results of implementation that such software tools have the potential to be used for the benefit of the community. While the research seems to suggest that a critical factor in this success is creating the right environment for learning and interaction and also, a sense of ownership in the community towards the initiative, this needs to be studied further. It would be particularly useful if such software can be applied for the needs of different marginalised groups, such as those from specific caste or ethnic backgrounds or the disabled, in order to study whether it can serve their specific information needs. 1 The article is based on findings from research undertaken in a network of ICT initiatives with support from UNESCO. The author is responsible for the choice and the presentation of the facts contained in the article and for the opinions expressed therein, which are not necessarily those of UNESCO and do not commit the Organisation. The author acknowledges with thanks the editorial support and inputs from Savithri Subramanian, Research Coordinator based at UNESCO, New Delhi. 3 Madrasa is an orthodox place of learning in Islam. Babul Uloom is located in Seelampur and has provided free-of-cost space for the ICT centre. 4 Research on ICT Innovations for Poverty Reduction, Slater. D. et al, 2004, UNESCO. 5 'Communicative ecology' refers to the complete range of communication media and information flows in a community. 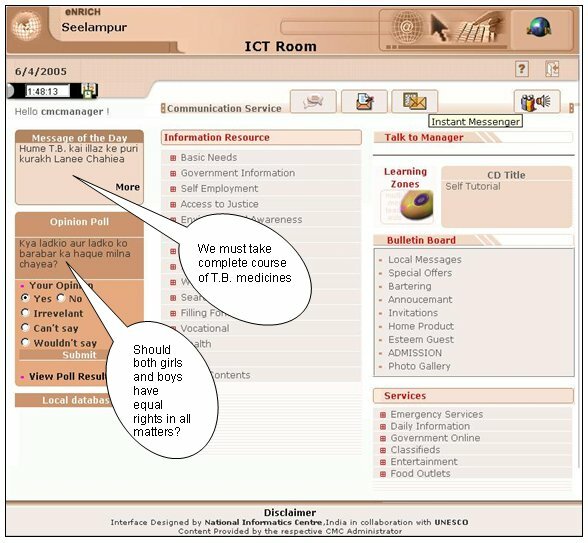 It places ICTs (radio, computers, mobile phones, print media and so on) in the context of all the ways of communicating that are important locally, including face-to-face interaction. It is recognised that any 'new' connections and networks (social and technical) that develop as a result of project work and the introduction of individual media technologies will be far more effective if they are somehow interconnected with existing, locally appropriate systems and structures (Slater and Tacchi, 2004). 9 All pieces of raw data, quotes from the field etc are italicised in the article. These have not been edited and appear as they were recorded in the field. All names have been changed to protect the individual's identity. 10 However, this does not imply that they wear westernised clothes such as jeans and shirts that one would find in other Delhi neighbourhoods. Here, women wear only traditional clothes but in new designs and keeping with fashion. 11 Naat: Religious songs sung for the Prophet, Ghazals: Melodies of love, solitude, companionship and friendship, Sher-Shairi: Rhyming verses on a variety of topics. 12 DOTS, Directly Observed Treatment also known as the Revised National Tuberculosis Control Programme (RNTCP) of the Government of India, is a comprehensive strategy for TB control. Burka, M. (2001), "Obstacles to Women's Access to Information and Communication Technology in Developing Countries", Academy for Educational Development (AED). Gruber, S. (2001), "Communication Gone Wired: Working Toward a Practiced Cyberfeminism", The Information Society: an International Journal. Prahalad, C.K. & Hammond, A. (2001), What Works: Serving the Poor Profitably, Markle Foundation and World Resources Institute. Ryan, C. (2003), "African Connectivity No Guarantee of Economic Upliftment", Government Technology, May 2003. Sheriff, F.R. and Gnanalakshmi, S. (2006), "Empowering Rural People the e-Extension Way", i4D, No.1, January, 2006. Subramanian, S. (2003), Poverty and Gender hierarchies: Can ICTs make a difference? The case of Seelampur in Delhi, Paper for Experts meet on Development Communication organised by UNESCO, New Delhi in September 2003. Tacchi, J., Slater, D. & Hearn, G. (2003), Ethnographic Action Research: A User's Handbook Developed to Innovate and Research ICT Applications for Poverty Eradication, UNESCO.